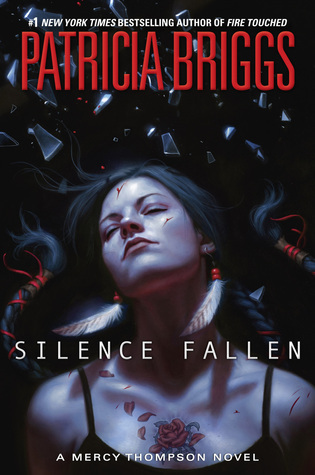 I received Silence Fallen in return for review from the publisher. Mercy is making cookies but is forced to run to the store for more chocolate chips which should be a routine trip. However, while leaving the store her SUV is hit and she's kidnapped by a strange vampire who wants more than he let's on. She finds herself in a strange country with a dangerous threat looming forced to risk it she flees into a strange countryside. All she has to do is find a safe place to hide till Adam and the crew can get to her but as it's Mercy it may be hard to do. When his wife is kidnapped by strange vampires Adam will stop at nothing to bring her back. Even teaming up with the Vampire master of the city who happens to have a connection to the vampire who kidnapped Mercy. They will need to play their cards just right if they want to find her getting out of Milan won't be an easy task but they are willing to enter the lion's den for her. With friends at his back hopefully, Adam can keep his cool long enough to save Mercy who holds them all together. I love Mercy so much!!! She's one of my favorite characters and has been since I read her first book Moon Called years ago. She's one of those characters who captures your heart and as she just keeps evolving through the books you love her more. She's got a special place in my heart, and will always be my favorite coyote. I love Adam he's a perfect partner for her because he really understands her in ways no one else would. I've been eagerly waiting to get my hands on Silence Fallen and when I finally had the chance to dive right in it was hard to put down. I actually finished it in just 24 hours and would have been quicker if not for this cold. I love the world the author has created mixing the werewolves with the vampire and fae all living in the Tri-Cities it just works so well. Silence Fallen is an action-packed, whirlwind adventure, that pushes Mercy to accept her destiny a little more and Adam to play the game. The author has done another amazing job creating a captivating story that is hard to put down, capturing the heart as well as the imagination. I love all the twists and turns throughout the story. I highly recommend taking a chance on Mercy Thompson's books you won't be disappointed they just keep getting better with each book. I loved it so much!!!! I've read a lot of great things about this book. I cant wait to read it!! Yes...this was perfection from the time-line to traveling across Europe to the supernatural creatures! Fab review my friend! Yes! I love Mercy so much. She really does keep growing and changing, which is such a breath of fresh air!